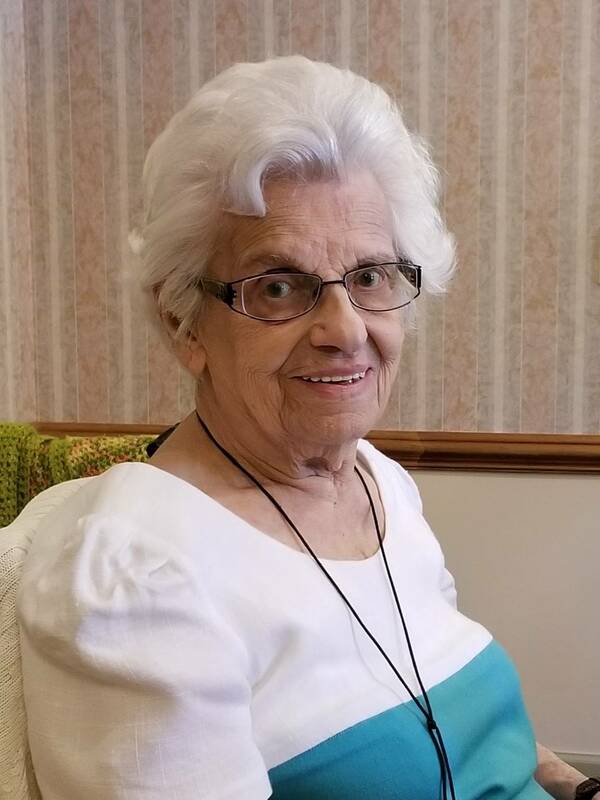 Erina Gaiotti Balestracci, passed away peacefully at The Willows, Holmdel, NJ on March 17, 2019. She was 97 years old. Erina was born in 1921 in Farra di Soligo, Treviso, Italy. As a child her family immigrated to France and then to Malmedy, Belgium where her parents were proprietor of Café de etoile d’or, hotel and café, and where she spent most of her life before coming to the U.S. During WWII she met and married her U.S. soldier, Alfred Balestracci in September 1945. As a war bride Erina immigrated to the U.S. via the liberty ship USS George W. Goethals, arriving in May 1946. She was a homemaker devoted to her family, home and her hobby, sewing. She was a master seamstress, making beautiful clothes for her five daughters and herself. She was a member of the Cosmopolitan Club for war brides in Long Branch, where club members would have yearly fashion shows displaying their creations. She was a long-time parishioner at the Church of Saint Catharine, Holmdel, NJ and was also a member of the church weekly rosary group. She was fluent in four languages and taught herself perfect English by reading the Readers Digest. She was a devoted wife and mother and was always there for her family. She will be forever missed. She was predeceased by her beloved husband Alfred of 71 years, and her parents Umberto Gaiotti and Rosalia Zilli Gaiotti, sisters Olga Gaiotti Lemaire, Malmedy, Belgium and Irma Gaiotti, Liege, Belgium. Surviving are her five children: Diana, North Brunswick, Patricia and her husband Felix, Keyport, Annette, Long Branch, Theresa and her husband Wayne, Keyport, Rosanne and her husband Kevin, Perth Amboy, granddaughters Gabrielle and Claudia, Keyport, and nephews Philippe and his wife Gisele, Belgium, Andre and his wife Isabel, France and Jean-Jacques, Belgium. In lieu of flowers please make donations in Erina’s name to Saint Jude Children’s Research Hospital, 262 Danny Thomas Place, Memphis, TN 38105, stjude.org or Visiting Nurse Association of Monmouth County, 23 Main Street, Holmdel, NJ 07733, vnahg.org/ways-to-give. To leave a message of condolence or to share a memory of Erina, please visit her page of tributes at www.holmdelfuneralhome.com.